SRDRS is a rapidly deployable rescue asset that can be delivered by air or ground, installed on pre-screened military or commercial vessels of opportunity (VOO) via a ship interface template, and mated to a distressed submarine within a 72-hour time to first rescue period. 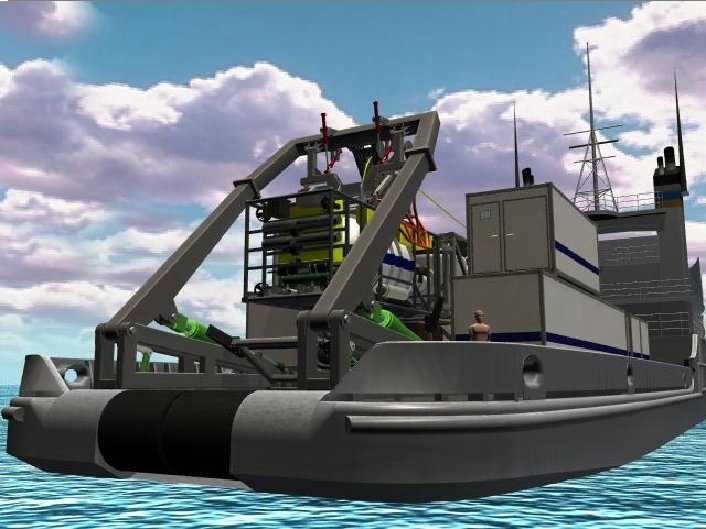 SRDRS is a three-phased acquisition program that will deliver advanced submarine rescue and treatment assets to the fleet. The first phase of the program was the Atmospheric Dive System 2000 (ADS2000) which was delivered to the Navy in 2006. (ADS2000) is a manned, one-atmosphere dive suit capable of inspecting disabled submarines and clearing debris from escape hatches. The RCS constitutes SRDRS second phase. SRDRS-RCS consists of Falcon, the tethered, remotely-operated Pressurized Rescue Module (PRM), its launch and recovery system, and its support equipment; all of which are controlled from a VOO. 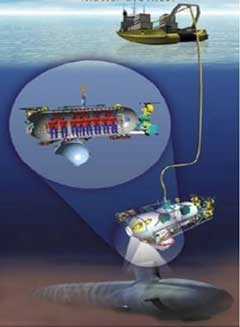 The final phase of the SRDRS program is the Submarine Decompression System (SDS), scheduled for delivery in late 2012. SDS will allow rescued submariners to remain under pressure during the transfer from the PRM to hyperbaric treatment chambers aboard the VOO. Unlike Mystic, which could only be transported to the disabled submarine via modified submarines, SRDRS is a "fly-away" system that can quickly and easily be mobilized via large military or civilian transport aircraft and installed aboard a variety of VOOs within hours of notification of a submarine in distress. Falcon can conduct rescue operations to a depth of 2,000 feet, can mate to a disabled submarine at a list and trim of up to 45 degrees, and can transfer up to 16 personnel at a time. Mystic required its own power source – necessitating a two-hour battery charge between cycles. Because SRDRS-RCS receives its power from a VOO via an umbilical, it can operate around the clock without pause. 631k The Navy's Deep Submergence Unit tested a new system known as the submarine rescue diving and recompression system SRDRS with the Chilean submarine CS Simpson (SS-21) on 17-18 September 2008. The SRDRS is designed to be rapidly deployed to any location in the world via air or ground and can be installed on military or commercial vessels when a call for assistance is received. It will replace the de-activated deep submergence rescue vehicle (DSRV) system as the Navy's premier submarine rescue capability. 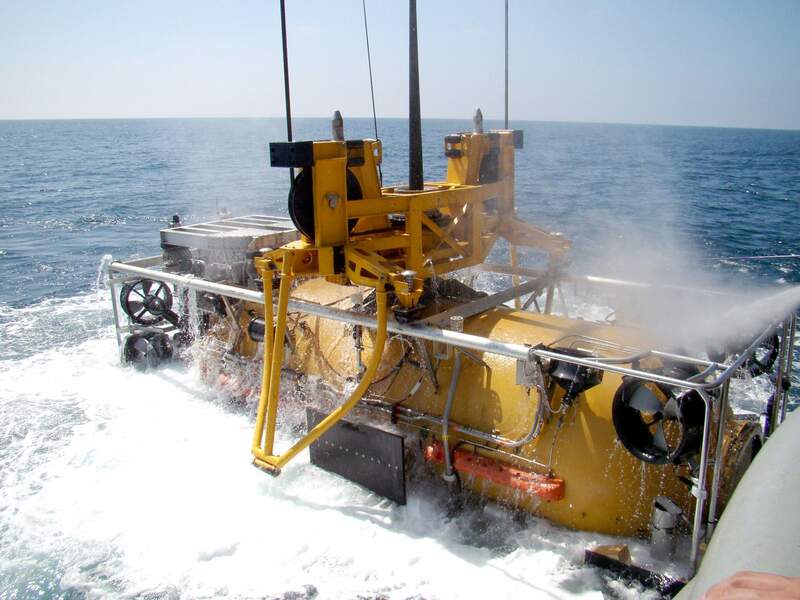 "The SRDRS is the U.S. Navy's 21st century submarine rescue system and represents state-of-the-art technology for submarine rescue systems," said Lt. Rich Ray, the former engineering officer of the rescue submarine Mystic (DSRV-1). According to Ray, the SRDRS is designed to be mobilized, installed on a transport vehicle, transported to a site and mated to a distressed submarine to begin rescues within a maximum of 72 hours. During the exercise, and with operators inside, the pressurized rescue module (PRM) was remotely controlled via a topside control console on board USNS Navajo (T-ATF 169). Next, the PRM descended more than 400 feet to the Chilean submarine CS Simpson and mated with the escape hatch. Once the simulated transfer of personnel was completed, the PRM detached from the submarine and ascended to the surface. The PRM was then recovered from the sea and craned onto a deck cradle installed aboard USNS Navajo. Upon recovery, the PRM docked with the submarine decompression system (SDS). Personnel were then transferred to the SDS from the PRM via a pressurized flexible man-way to undergo decompression. "It was an awesome experience to work with the Chilean Navy," said DSU Machinist's Mate 2nd Class (SS) Chris Huffstetler. "I believe it is beneficial to work with foreign navies in case something really happens…we can provide immediate support." The SRDRS concept of operations has been developed to support rescue of up to 155 personnel from a pressurized disabled submarine. The PRM accommodates 16 rescued personnel per trip and requires two operators and a diving medical technician. "The operation was a phenomenal success thanks to the cooperation of the entire crew," said Cmdr. Larry R. Lintz, deputy commander for submarine escape at Commander, Submarine Development Squadron 5. "Now we can officially say, the SRDRS is the Navy's official submarine rescue system." Photo # N-7029R115 by Mass Communication Specialist 2nd Class (SW) Alexia M. Riveracorrea,courtesy of ctf74.navy.mil. 35k SRDRS - Concept. Courtesy of phnx-international.us. 201k SRDRS. Courtesy of phnx-international.us. 25k PRMS Cutaway. Courtesy of phnx-international.us. 87k PDF on the SRDRS. Courtesy of oceaneering.com. 1.40k Sailors assigned to Undersea Rescue Command (URC) and contractors from Phoenix Holding International launch the Pressurized Rescue Module (PRM-1) Falcon, part of the submarine rescue diving and recompression system, into the water for the PRM's first dive of the operational readiness evaluation (ORE) on 19 July 2015. 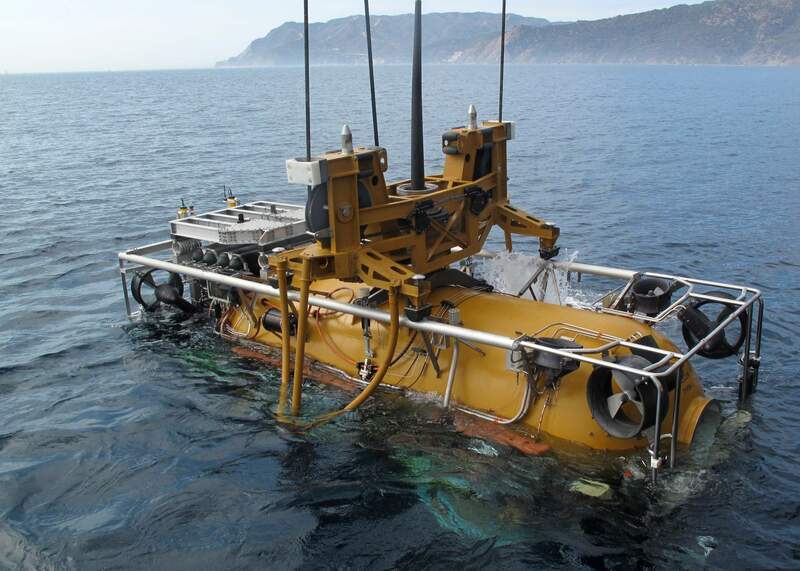 URC successfully completed the ORE, certifying the Navy's deep sea submarine rescue capability. USN photo 150719-N-ZZ999-102 by Daniel Moreno, courtesy of navy.mil. via Lee Wahler.